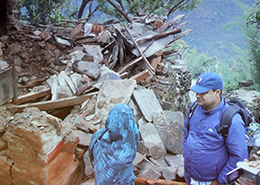 After surviving Nepal’s massive earthquake, researchers and staff of the University of Michigan are helping out with the relief effort, providing tents, food and other aid to hard-to-reach communities near the epicenter. Delivering the supplies involves a six-hour drive on a road that eventually ends, said Dirgha Ghimire, associate professor at the U-M Institute for Social Research. “We trek up with the relief packages for another three to five hours depending on the weather,” Ghimire said during a Skype call Thursday with his colleagues in Ann Arbor. The relief packages include a tent that sleeps five along with lentils, salt, sugar, instant noodles and flattened rice – cooked, dry flakes of rice popular across South Asia. The supplies are delivered to hard-hit areas in Gorkha and Lanjung districts, just north of the epicenter. Two weeks ago, Ghimire went to Chitwan district in northwestern Nepal to continue several research projects and conduct a workshop on survey methods at the Institute for Social and Environmental Research, an ISR partnership. Several other universities and institutes vacated Nepal after the earthquake. 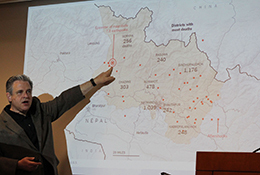 “The University of Michigan has had a research relationship in Nepal since the 90s,” said William Axinn, a professor at ISR who started the first ties in the region. He added that the institute has several ongoing research projects, including one to study the ecology of the region and another on food security. With the lack of tents and food in the markets, Ghimire has been going directly to factories to collect supplies for relief packages. The fact that the institute has been in the region so long has helped it procure things on credit that are in short supply in the shops. “We have run out of money and are working on personal relationships to get things directly from factories,” said Ghimire, adding that the suppliers know they will be compensated eventually. They have delivered nearly 300 packages and have another truck with 130 packets ready to go out Friday. Each package costs about $25 to put together. “We worked all day Sunday and the first truck went out on Monday,” Ghimire said. Just 24 miles (40 kilometers) from Kathmandu, Chitwan has been relatively unharmed from the earthquake. But Ghimire said the fear is palpable.